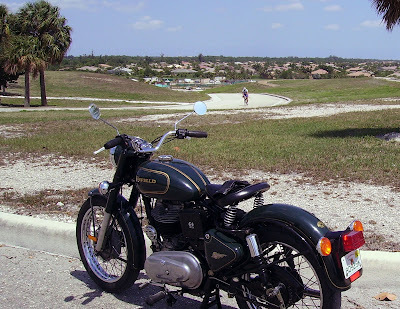 A Royal Enfield motorcycle in South Florida lives a life of stop-and-go driving 0n absolutely flat terrain. Only the occasional on-ramp or off-ramp offers an opportunity to swing through a curve with changing elevation. To break that pattern, I went to the dump. 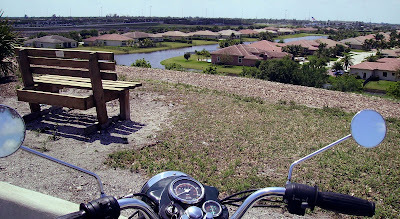 Yes, a former landfill dump in Davie, Florida, has been converted into a park, complete with roads curving along its sides. The dump is high enough to allow people to paraglide from the top, although I've never seen anyone doing it. Altitude sickness is not a problem: I figure the top is about 100 feet above sea level. 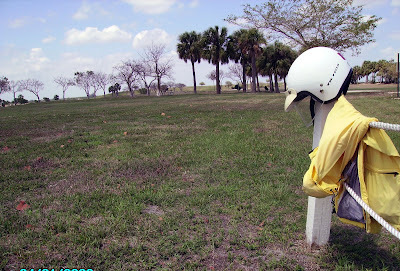 Still, it was fun to see, if only for a short distance, how the rest of the world lives. The speed limit on the landfill (called Vista View Park) is only 15 mph. But the police car in the parking lot didn't stay long and, after that, I had the park roads to myself. I didn't go fast; the road surfaces are gritty from lack of use. And there are soft spots. When I stopped to take a picture at one point the center stand dug into the parking lot surface and didn't raise the bike an inch. I am happy to say that the dump smelled like a park, not a landfill. 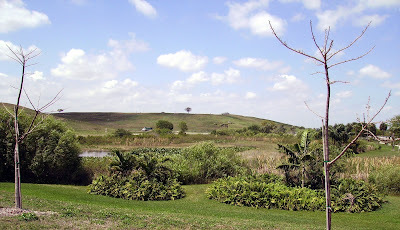 Landfill dumps are common in Florida, particularly along Florida's Turnpike, which runs the length of the state. It's natural to wonder if they one day could be linked together by landscaped roads. Sort of a Blue Ridge Trashway.